All transactions are safe and secure with a reliable history in online purchasing behind each of our associates. 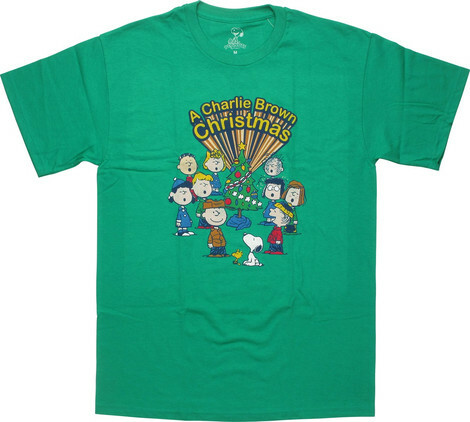 Buy the A Charlie Brown Christmas t-shirt to own Peanuts clothing and merchandise. A Charlie Brown Christmas is one of the most adored holiday favorites of all time. Here, we see his decrepit twig turned into a Christmas tree wonder with the assistance of his loyal friends. Clearly, he's taking time out from playing football and baseball to discover the true meaning of Christmas. If you want to spread holiday cheer, get this Christmas Charlie Brown t-shirt for yourself and pick up a Charlie Brown action figure for a friend. Add Linus and Pigpen tees or a Charlie Brown Zig Zag shirt for a fun pairing. In addition to the A Charlie Brown Christmas tee above, browse the Peanuts Clothing Gallery for more apparel like men's and women's clothes, kids shirts or hoodies.